The 2014 season begins with the renewal of an old rivalry as Lebanon Valley meets Franklin & Marshall for the first time in 32 years. Both teams are coming off postseason appearances in 2013, including LVC's NCAA berth. The game is being video streamed live and for free on F&M's GoDiplomats.com. The game will be broadcast on the Flying Dutchmen Radio Network on WMSS 91.1 FM in Middletown and WWSM 1510 AM in Lebanon County. John Wilsbach and Brian Keyser will call the action. The game will be streamed live and for free at WMSSFM.com and GoDutchmen.com. [Forecast] Highs in the upper 80s and humid with an increasing chance of showers or thunderstorms later in the afternoon. [Directions] Admission is free for the game. This will be the first meeting since 1982 between former conference rivals Lebanon Valley and Franklin & Marshall. Lebanon Valley is coming off an 8-3 season that saw it win the MAC title and earn its first-ever NCAA berth. F&M Went 7-4 and won the ECAC Southeast Bowl. Both teams feature preseason all-Americans. For LVC, it's outside linebacker Frank Gaffney; for F&M it's cornerback Aaron Fant. At 24 miles away, F&M is LVC's closest geographical rival in Division III football. Lebanon Valley is 7-3 in its last 10 season openers, including three wins in a row. This is the 34th meeting and first since 1982 between the two mid-state rivals ... F&M leads 25-8-1 ... LVC has won six times on the road, the last in 1971 ... At 24 miles, F&M is geographically LVC's closest rival in NCAA Division III football, compared to 36 miles for Albright and 44 miles to Dickinson ... Despite that, the two teams have not played since F&M left the MAC to form the Centennial Football Conference in 1983 ... It is one of the oldest rivalries in LVC football, dating back to the first meeting in 1899, a 28-0 Diplomat win in Lancaster .... Jim Monos has never faced the Diplomats. LVC will have four first-time captains in 2014, all seniors. Tyler Dean, Frank Gaffney, Brian Murphy, andJoey Scerbo were elected by their teammates after the 2013 season. Lebanon Valley, coming off a MAC title in 2013, was picked third in the preseason coaches' poll. In a tight vote at the top, co-champion Lycoming was first with five first-place votes, followed by Delaware Valley with one but 68 points overall, and LVC with four first-place nods and 65 votes. Widener and Albright trail LVC. Coming off his standout 2013 season, senior outside linebacker Frank Gaffney earned a bevy of preseason honors. He racked up preseason all-America awards from D3football.com, BSN, Lindy's, Sporting News, and USA College Football, as well as earning a spot on the D3 Senior Classic watch list. Gaffney was a consensus all-American in 2013 and was a Cliff Harris Award finalist. A look at the numbers might make one think that LVC lost a lot from 2013 due to graduation - and they did, with 17 starters gone from a senior class of 22. But a deeper look shows that the Dutchmen have plenty of experienced firepower back, regardless of whether or not they had a "starter" label or not. A few key examples: wide receivers Tyler George and Darryl Sweeper, who will start their first career games Saturday but were a big part of the offense last season; outside linebacker Alex Beamesderfer, who compiled 33 tackles last year as a back-up; or defensive backs Kevin Antol and Bryan Ek, who have never started a game but combined for 46 tackles and two touchdowns a year ago. After their final walkthrough on Friday, Lebanon Valley will receive a special good luck charm ahead of the F&M game - the football used by LVC Hall of Famer and Ephrata native Roy Albright '30 to score the winning touchdown against the Diplomats in a 6-0 victory in 1929. The ball, donated by his descendants, will go on permanent display in the Hall of Champions after this weekend. Coincidentally, 85 years later LVC has another former Ephrata quarterback on its roster - back-up Jeremy Franck. The past five seasons represent the greatest era of success in LVC football history. Since 2009, LVC has gone 37-17, including three 8+ win seasons, and gone to the postseason four of the last five years. The Dutchmen have recorded six straight winning seasons. LVC brings in 43 newcomers for 2014, including 41 freshmen and two transfers. The freshman class includes four pairs of high school teammates (Exeter's Evan Lysczek and Ryan Vogel, Middletown [Md.] products Tim Pirrone and Tim Schumacher, Pine Grove's Ryan Heim and Guy Zimmerman, and South Western's Tyler Sterner and Brandon McMinn) and one brother reuniting with his older brother (Steve Salcedo and junior John Salcedo). The class includes LVC's first two Florida recruits, running back Jon Jones and cornerback Ja'von Nelson. Transfer Nick Cascarino came to LVC from RPI as a quarterback through spring ball but moved to safety in preseason, while wide receiver Kyle Zimnik arrives from Clarion after redshirting last season. LVC returns five starters on offense ... The Dutchmen will be quarterbacked again by Brian Murphy, who threw for 1,781 yards and 16 touchdowns as a junior ... At tailback, Brendon Irving returns after rushing for 834 yards and seven touchdowns as a freshman last year. Senior Jeff Hacker backs him with freshman Spencer Moser in the mix ... Bobby Conlon will take over at fullback for the graduated Evan Fink '14 ... Wide receivers Darryl Sweeper and Tyler George will earn their first career starts, but the pair generated plenty of offense last year combining for 514 yards and 6 TDs a year ago ... Backups Mike Smith and Joe Bennett also had plenty of game experience last year ... At tight end, Seth Miller will step into the starting role backed up by converted linebacker Dan Thompson ... The offensive line will be anchored by left tackle Tyler Dean and right tackle Zach Smith. Dean has more career starts (29) than any other active Dutchman, while Smith is coming off an all-MAC season at right guard as he makes the move outside ... Center Bryant Weller started three times a year ago as a freshman, while two guards -Ryan Dotson on the left and Tyler Good on the right - earn their first career starts. LVC returns only three starters on defense, but has significant experience at every position ... Senior Joey Scerbo is the lone returning starter on the line coming off a 31-tackle, 3.5-sack 2013 season ... SeniorAndrew Livingston, who sat out 2012 after a solid sophomore season, returns to earn the other starting end spot for graduated all-American Zach Halpin '14 ... Clayton Williard will take over for Kevin Smith '14 at nose tackle ... At linebacker, all-American Frank Gaffney returns coming off an 82-tackle, 13-sack season ... Alex Beamesderfer (33 T in 2013) will be the other outside backer, while Trevor St. Clair (28 T, 3.5 TFL) and Tyler Laudeman (26 T, 2.0 S) will start inside ... In the secondary, cornerback Zach Wierman is the only returning starter after leading the team with seven break-ups last year ... Bryan Ek(10 T, 1 INT) moves up into the other corner spot ... Kevin Antol and DJ Johnson take over the safety starting roles. Antol made 36 tackles with a pick last year, while Johnson appeared in six games with three tackles as a junior. 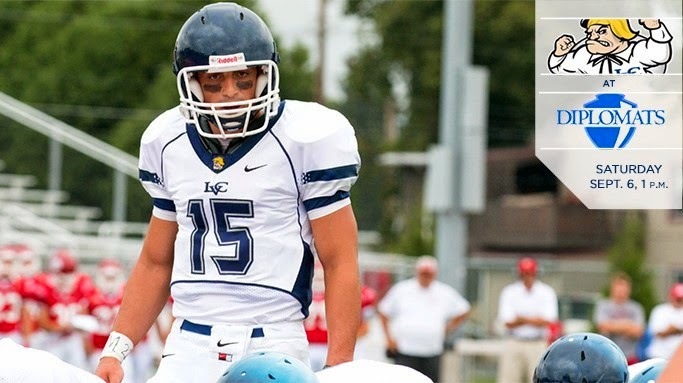 LVC has two significant holes to fill on special teams to replace kicker Sean Fakete '14 and punter Jake Zeigler '14 ... Junior Matt Smoluk will step into the starting placekicker role, while senior Jeff Hacker, who impressed with a 39.0-yard average as Zeigler's backup last year, will punt ... Bryan Ek and Mike Smithare back on punt returns after each averaged 5.0+ yards per return last year ... On kick returns, Ek (22.2 ypr in 2013) will be paired with freshman Spencer Moser ... Smith will also hold, while long-snapping duties will be split between Trent Mars on place kicks and Frank Gaffney on punts. Lebanon Valley will open at home Sept. 13 against Widener.